High Tunnel Vent is a roof or end wall installed system that provides supplemental ventilation for extremely hot conditions. During moderate weather, high tunnels are generally vented by rolling up the sides and opening the doors on each end. However, extremely hot and humid weather often requires additional ventilation, and the best vent position is at the roof or peak of the structure. Ken-Bar's High Tunnel Vent provides a chimney-effect movement of hot air out of the tunnel. These vents are intended for supplemental ventilation only. They are not the primary mechanism for temperature control in high tunnels. The High Tunnel Vent is constructed of a rigid aluminum frame and shutters. Vents Wiggle Wire right into the plastic for quick installation and no framing needed. 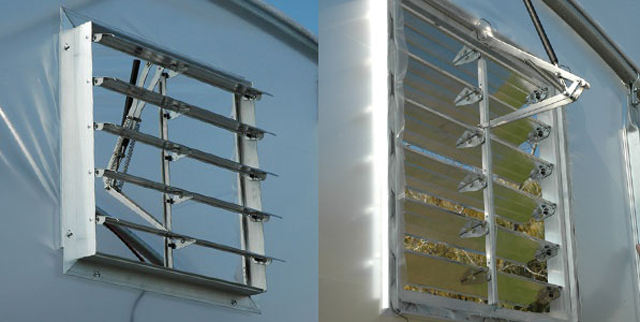 Each vent comes with two types of vent openers: manual and auto-temperature. 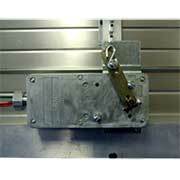 The manual opener is operated with a hand pull wire, while the auto-temperature opener operates automatically and can be adjusted to open at temperatures between 60-77° F.
Uni-vent automatic openers and replacement cylinders are available individually without vents.